Mother's Day Special! 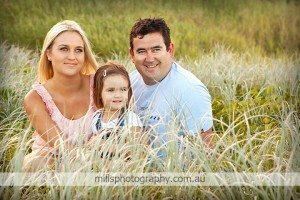 - professional location photo shoot - 3 beautiful locations to choose from - Beach, Rain Forest or Park. Simply contact us and we will send you a voucher - then your loved one can book their photo shoot in whenever they are ready. A Mothers Day Portrait Gift Certificate is something your Mum will love, she will receive a professional lifestyle portrait photo shoot with her loved ones. 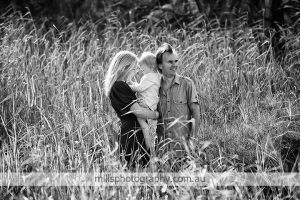 This timeless gift consists of a 30 minute relaxed lifestyle shoot at one location of your choice - either beach, rain forest or park. 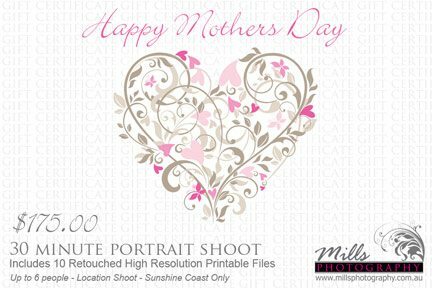 We supply you with 10 High Resolution printable files after they have been edited and retouched in our studio. The files may be used for printing photos at your chosen photo store. We can also arrange for high quality prints, canvases or "Ice Mounts" of any favourites from the selection. Photos are a lasting and meaningful gift, your Mum will treasure these memories for years to come. Use the easy form below, and we will contact you to arrange the rest!